Parents: April is Math Awareness Month, and we're shining the spotlight on the issue of Algebra Readiness. There's been much media speculation as to whether or not Algebra should be required in school, and we'd like to take a few minutes to stress the importance of this critical math topic. Fact is, Algebra is more than just another subject on your child's math trajectory. It marks a turning point in a student's mathematical education—it's the culmination of all the math that has come before it... and the foundation for all the high school and college math that is to follow. Knowledge of Algebra is a firm prerequisite for even the most basic college-level math and science classes! Too often, frustrated math students wonder, "When will I ever use Algebra?" Consider this: according to a study conducted by the U.S. Department of Commerce, in the first decade of the 21st century, STEM (science, technology, engineering, and math) jobs grew at a rate of almost double that of non-STEM jobs. STEM jobs are projected to continue to grow at a rate of almost double that of non-STEM jobs throughout the current decade. The study also states that "STEM workers command higher wages, earning 26 percent more than their non-STEM counterparts." Math is the backbone for all STEM fields—as the nationwide demand for high performing STEM professionals steadily increases, so will the demand for workers with strong math skills... starting with a solid knowledge of Algebra. 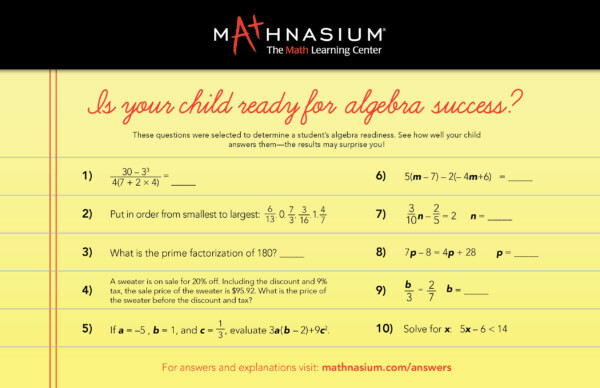 Unfortunately, we see too many students come to Mathnasium in need of Algebra help (and math help in general) simply because they lack the prerequisite knowledge necessary to make sense of the material covered in class. That said, getting ready for Algebra actually starts way before your child takes Pre-Algebra in middle school. Using equations and variables to express relationships between numbers, Algebra presents your child with the more abstract side of math. In order to make sense of these abstractions, they need to master their number facts, build their computational skills, and gain number sense (an intuitive understanding of how numbers work). This goes way beyond memorizing algorithmic processes! Geometry formulas and vocabulary: perimeter, area, circumference, etc. ... as you can see, many of these hearken back to topics covered in the early elementary grades! If your child is getting ready to dive into the heart of Algebra next school year, sit with them and give our Algebra readiness questions below a shot. The results may surprise you! When you're done, click here to check your answers (scroll down to "Algebra Ready")! Once your child has these prerequisite skills on lockdown, they'll be factoring polynomials and finding slope intercepts like a champ... and become stronger problem solvers and mathematical thinkers along the way! Need more information? We're here to help. 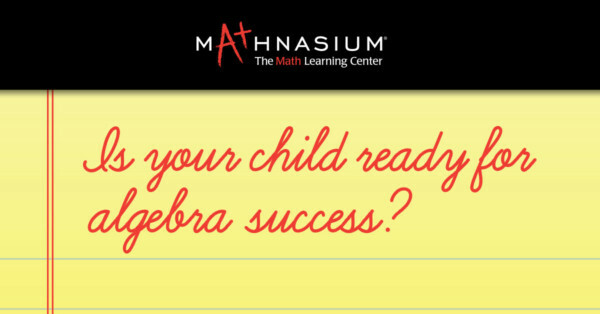 Contact your nearest Mathnasium—we can help you crack the Algebra Readiness conundrum and have a program specially designed to get kids on track for Algebra success!